Award Year: 2011 One of the greatest challenges in United States public health is the growing number of people with disabilities, now numbering over 50 million. While there is a broad awareness about the usefulness of online mutual help groups, it is less well-known that individuals with disabilities have started to self-organize in grassroots initiatives in online virtual worlds, such as that of Second Life (SL). These immersive three-dimensional virtual worlds provide distinctively innovative modes of cyber communication for people with disabilities through the shared co-presence of avatars, which are embodied representations of selves. This project aims to provide in-depth analysis of self-organized disability-related mutual help groups in various virtual worlds. By studying these innovative associational activities, the project is exploring future directions to increasing the potential of people with disabilities through the creative merger of technology and human capital. With this aim, Dr. Ikegami will be conducting a thorough ethnographic study and sociological analysis of various targeted mutual help groups in virtual worlds. Eiko Ikegami is a professor on the graduate faculty of sociology at The New School for Social Research. 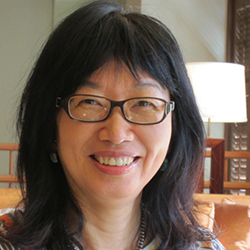 Her research and teaching focuses on comparative historical sociology, Japanese society, and the sociology of culture. Her current work focuses on public spheres in comparative perspective, civility and state formation in Japan, and identities, network, and social change. She is the author of Bonds of Civility: Aesthetic Networks and Political Origins of Japanese Culture (Cambridge University Press, 2005), and The Taming of the Samurai: Honorific Individualism and the Making of Modern Japan (Harvard University Press, 1995). She is also working on a book project on state transformation in China, Japan and Ottoman Turkey. She has held fellowships at the Institute for Advanced Study in Princeton and at the Center for Scholars and Writers, New York Public Library. Before coming to The New School she held positions with Yale University and Nihon Keizai Shinbun (The Japan Economic Journal) in Tokyo. In 2003, she was elected to the chair of the Comparative Historical Sociology the section of the American Sociological Association. She received her Ph.D. in sociology from Harvard University.